Huntsville Vegans will have a table set up at Earth Fare in Huntsville on Thursday October 24th, 2013 from 4pm to 8pm (setup is at 3:30). We’ll be distributing information, be available for questions, and will sample out some vegan goodies. We’ve got some big projects in the works in case you’d like to get involved, as well as numerous social events to take part in. Visit and find out what’s coming up. Come by for Vegan/Animal Rights literature, DVDs, schedules of upcoming events, lists of resources, or just get your questions answered. If nothing else, stop by to say hi, show your support, and meet some of us! Our tabling will be going on during Family Dinner Night – kids eat free with the purchase of a $5 adult meal. We’ll have coloring sheets on hand and Natalia is bringing her lovely chicken puppet. If you have kids please bring them out to meet other vegan parents. If you have any questions or suggestions or would like to help out, please email us at huntsvilleveg@gmail.com. We look forward to meeting all of you. Huntsville Food Not Bombs is an all-volunteer organization that provides warm meals to anyone free of charge. Through donations and the recovery of food that would otherwise go to waste we are able to serve meals to those who might otherwise go hungry. 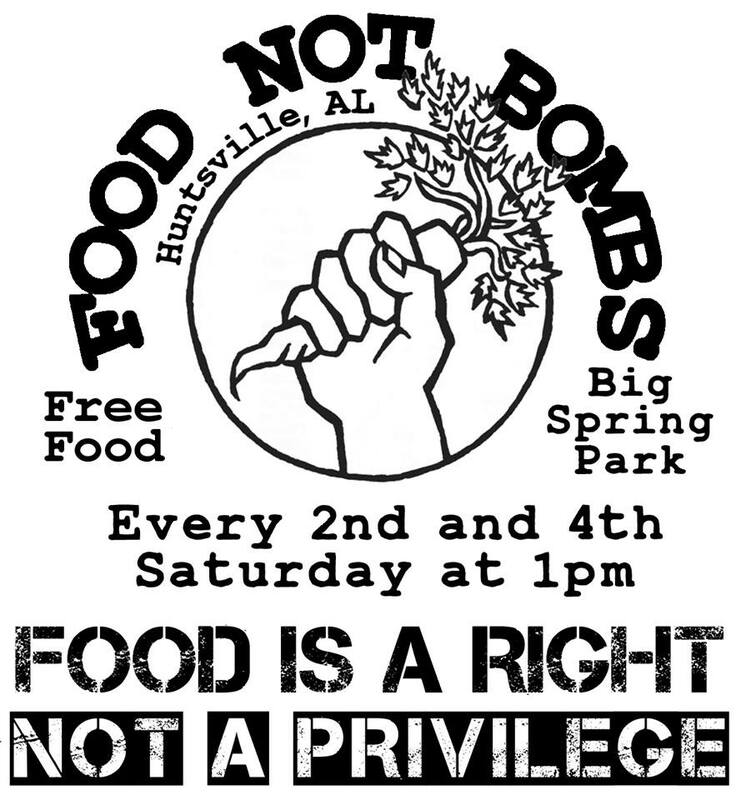 Join us for the first new food share by Huntsville Food Not Bombs on Saturday, October 26th at 1pm in Big Spring Park, in downtown Huntsville. All are welcome. For the sake of inclusion, food justice, health, expense, and peace, everything we serve is completely free of animal products. If anyone would like to help us serve food, please just let us know– we’d like to eat too! If you’d like to volunteer time or ingredients for food prep, we’re meeting early Saturday morning at Alex and Natalia’s house in Madison. Cleanup help after the food share is also very much appreciated. Just prior to when we serve food, we invite everyone to take part in a Really Free Market. That’s where you bring all the stuff you might otherwise sell or donate and bring it to freely share with anyone who might need or want it (and of course everyone is free to take anything themselves). We’re setting out a tarp at 12:45. The Really Free Market is a place where people come together to take what they want and give what they can. There is no money, trade, barter, or remuneration of any kind. What can you bring? Anything you’d like to give. From clothes that no longer fit to books, stories, crafts, services, performances, music, a skill you’d like to share, or anything else that you think would benefit the community. Don’t have anything to give away? Don’t worry; no exchange is necessary to participate. Please come out and take anything you like. It’s FREE! note: We do not use any tax money or grants to fund our activities, although we gladly accept voluntary contributions. Thanks everyone!